Calligraphy has had a huge resurgence thanks to the popularity of calligraphy classes, Instagram and the introduction of tech into such a traditional art. Find out everything you need to know before you decide to learn calligraphy. Learn it's history and find out the tools of the trade you'll need to get started! Calligraphy is an ancient art that developed from decorative letterforms and symbols. It celebrates letter form in many different ways including the formation of each one, and the joining of how they create words and sentences. The ancient art can be dated back as far as 600 B.C.E in Latin scripts and on walls in Rome. It was also used to decorate the Bible and other religious texts. However, in the 15th century illustrated manuscripts, which featured calligraphy in it's most decorative form was replaced by the ease of the printing press. Calligraphy and it's time-consuming art of love dwindled as it was favoured for mass printing and practicality. For the revival of calligraphy, we have Edward Johnston to thanks. He began studying ancient calligraphy manuscripts and began to produce a number of publications on the art of calligraphy. It was Johnston that developed his own calligraphic style that's written in a thicker pen. Johnston created the rounded letter shapes at the slanted angle that we recognise as calligraphy today. Since this revival in the 19th century though, we have seen further advancements, as the arts and crafts movement has propelled calligraphy even further forward and has the seen the transformation of it to match modern trends and even digital advancements. Calligraphy remains popular about the maker movement because it is accessible. Anyone with the will and the drive can learn the art of calligraphy and it can be used in conjunction with so many other art forms. For starters, you'll need to make sure you have the right supplies. Pens: You can either start with the traditional nib and straight pen. The nibs are interchangeable and come in various different shapes so you can achieve the desired letter formation. With this traditional, you'll also need ink, which we explain below. You can, however, start with an all-inclusive pen, which has been developed along with the modern calligraphy movement. The Tombow Fudenosuke Brush Pen is a great one to start off with and works very much in the same way as a traditional nib and ink. You can get it in hard or soft, although the hard one is probably easiest to start off with as a complete novice, as it's easier to control. Straight Pen: These are a lot less fiddly when it comes to choosing than nibs. You want to make sure you get one with a universal insert, that fits all nibs. Also, you want to get one that's comfortable for you to hold and one that looks good for you as well. A little like choosing a wand, this is the straight pen you'll have for all your calligraphy making magic, so you want to get the right one. Nibs: Nibs are notoriously tricky to pair with. They are an essential part of your calligraphy journey because as you begin and develop your skills, your nibs will open you up to different styles and looks that you may not have been able to get using a singular nib. There are loads of brands out there, but as far as recommending perfect nibs, they are very much on a trial and error basis. For beginners, the ones from Brause are tailored to suit your needs. However, we do recommend starting with an inclusive pen, just as they are a little easier to master. Ink: Anything that stains paper can be classed as being calligraphy ink. There a wide range of inks that you can get your hands on, in all sorts of glorious different colours. One of the most popular inks for beginners to start with is the Speedball India Ink. This ink, in particular, is waterproof when dry, so no need to stress about smudging or anything like that, and you can add other layers on top of it, in different colours should you so wish. 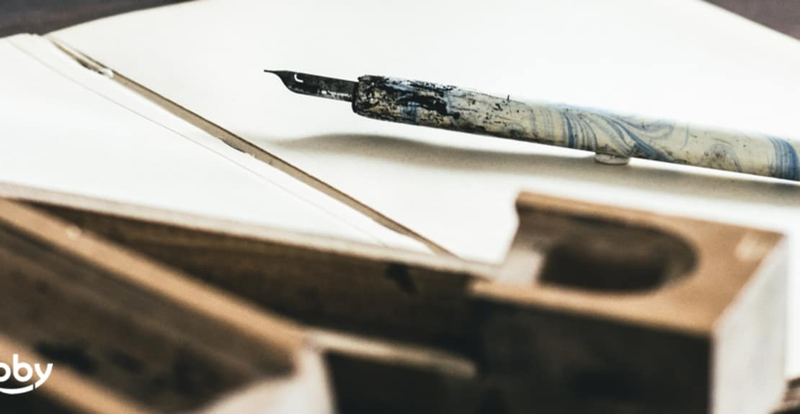 Paper: Paper is rather essential when it comes to calligraphy, as you have to make sure you find a good one, that is thick enough to hold the ink but also smooth enough so not to create feathering effects or dragging of the nib when you begin. We recommend the Canson watercolour pad. This particular paper has two textured sides, so the smoother side can be used for smoother calligraphy as well as watercolour use, and the more texture sides can hold layering and pointed pen calligraphy a little better. Hundred of calligraphers before you have mastered the art of lettering and are now teaching us mere mortals how to create this stunning wording. This is easily the best way to learn, as hands-on learning is second to none. Picture school art classes but just for calligraphy. Calligraphers, naturally, are drawn to the aesthetics of life, so their classes always tend to be beautifully put together and are often held in cute cafes that also serve matcha's in coordinated teacups with outrageously good looking cake. Living in London? Learn calligraphy with Alice Gabb. The trendiest calligraphy artist out there, Alice very much has her own style to modern calligraphy which is hugely popular. Alice has worked with some enormous brands, including Jo Malone and runs not only a business from her calligraphy but a stormingly successful one. Alice runs either private, bespoke classes but also she runs a regular group class at Palm Vaults, a beautiful cafe, in Hackney. Book her group modern calligraphy class here. Learn calligraphy with Katie from London Calligraphy. Katie has worked with some incredible brands over the years, including the Royal Family. Katie first began to learn calligraphy self-taught. This is where her passion and attention to detail for teaching really shines. It's clear that she knows exactly what she is doing when it comes to teaching. Book Katie's modern calligraphy class here. There are tons of other incredible calligraphy artists that teach workshops. If you are serious about learning calligraphy we recommend doing it this way. That way they can tell you not only the basics, but they can pass on their tips and tricks, their favourite places to buy supplies and even where they get their inspiration. Not only that, but you get to meet others in the class who are on the same journey as you, and learning in a group setting can not only be more motivating but also far more rewarding than doing it all by yourself. Start to learn the art of calligraphy with Obby today. There are various online classes. Creative Live and Yodomo (launching soon) do learning tutorials. You pay for the video course and learn at your own pace form an expert. You can also buy videos and starter kits from various professionals. Lindsey Bugbee from The Postman's Knock also has a series of video tutorials you can learn from. You can also pick up tricks and tips from Instagram, once you've mastered the basics. The best way to improve your calligraphy is by practising. At no point will you be able to write in calligraphy as fast your normal handwriting. Calligraphy takes times and patience. Download calligraphy practice sheets. Normally once you buy them and download them, you can print off as many as you like. Use these if you are struggling on a particular letter, style or case of the letter. Learn from others, but once you've mastered the art, put your own spin on it. Do you prefer all capitals or all lower case? Perhaps you like to heavily illustrate your letters or numbers. Calligraphy is an art, and although you learn the traditional way, modern calligraphy inspires you to add a little bit of your own personality.